At US Chemical Storage, we offer unbeatable services to our clients to deliver top-of-the-line chemical storage buildings that are fully customizable to meet any hazardous storage needs. Taking into consideration our 30 years of experience as the most trusted name in chemical storage, US Chemical Storage is the most reliable choice to protect your reputation and safely store your hazardous materials. We’ve compiled a few of our services to help you understand how US Chemical Storage is the most dependable chemical storage solution. Our buildings are custom-built according to your needs. We have an industry-leading 15 Year Structural Warranty. Our clients have given shining testimonials regarding our services. We’ve been a trusted name since 1983. Our experienced sales team will help you through the process of designing a US Chemical Storage building for your hazardous materials. Superior workmanship – all our buildings are engineered and hand-welded on our factory floor. 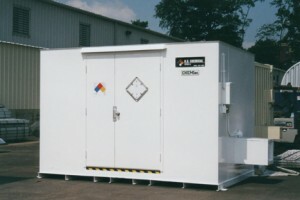 US Chemical Storage has always produced the highest-quality chemical storage buildings in the industry. Because of this, we have been contacted by a wide variety of clients, from individuals seeking hazmat storage, to major corporations and government agencies. No matter your needs, we can help. US Chemical Storage is here for you. Even if you’re new to the chemical storage process, our experienced sales team and engineers are here to guide you and help you determine what is right for you. Our aim is to facilitate the chemical storage process by giving you the safest, most durable chemical storage building, equipped with all the proper accessories to mitigate hazards for the material you intend to store. If you have any questions, any uncertainties regarding your chemical storage decisions, do not hesitate to contact us. At US Chemical Storage, our strength is your security.